If one module reads another then, in some situations, it should logically also read some other modules. 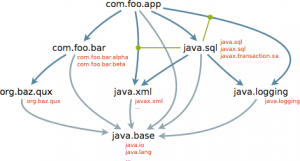 where Logger is a type declared in the exported java.util.logging package of the java.logging module. If the com.foo.app module is declared as above then this will not work: The getParentLogger method returns a Logger, which is a type declared in the java.logging module, which is not readable by the com.foo.app module, and so the invocation of the info method in the Logger class will fail at both compile time and run time because that class, and thus that method, is inaccessible. 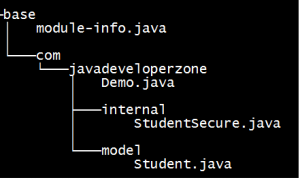 One solution to this problem is to hope that every author of every module that both depends upon the java.sql module and contains code that uses Logger objects returned by the getParentLogger method remembers also to declare a dependence upon the java.logging module. This approach is unreliable, of course, since it violates the principle of least surprise: If one module depends upon a second module then it is natural to expect that every type needed to use the first module, even if the type is defined in the second module, will immediately be accessible to a module that depends only upon the first module. The com.foo.app module can now include code that accesses all of the public types in the exported packages of the java.logging and java.xml modules, even though its declaration does not mention those modules. In general, if one module exports a package containing a type whose signature refers to a package in a second module then the declaration of the first module should include a requires transitive dependence upon the second. This will ensure that other modules that depend upon the first module will automatically be able to read the second module and, hence, access all the types in that module’s exported packages.